A few weeks ago, I received a collegial email from Alma Taawo alerting me to a newly published teachers' guide on Creative Commons. Not only had the Swedish National Agency for Education (Skolverket) published a reader-friendly manual for teachers, they had licensed it for use, re-use and sharing. Cool! Except... I don't speak Swedish. As luck would have it, within a few minutes of putting out a distress call via Twitter, I was introduced to a Alastair Creelman. Born in Scotland, Alastair has lived in Sweden since 1983, and had already forged connections with the authors of the original document. After a few brief emails, the text translation was underway. By coincidence, this correspondence took place in between Skype conversations I was having with group of 6th graders from Lawfield Public School in Hamilton, Ontario. Following up on an invitation from Zoe Branigan-Pipe I was introducing students to the potential of Creative Commons. Just prior to a return check-in with the class, I'd had the privilege of viewing a video clip of Zoe's students teaching adults about blogging, including why they were adding Creative Commons licenses to their blogs. Not only had they taken the lesson to heart, but they were teaching others about what they'd learned. 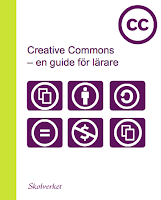 Even though it would be fairly easy for a tech-savvy educator to re-publish the Swedish CC document, I decided then and there, that it would provide a perfect opportunity for Zoe's students to further share their expertise by contributing to Creative Commons in the Classroom, a teaching resource. The invitation, and the class' enthusiastic response, is documented in a recent podcast. 1] You may be interested in visiting (or re-visiting) Creative Commons: What Every Educator Needs to Know, which was revised this winter. As proof that more people are learning about CC, the audio version has been viewed some 15,000 times! 3] This past weekend at TEDxNYED, Creative Commons pioneer, Lawrence Lessig, implored those present, to consider teaching and learning in a world characterized by openness and sharing. You can learn lots about CC or about presenting in general by watching Lessig's presentations.